Hope everyone's Thanksgiving was fun! I was on vacation so I refused to do anything strenous, just read about 4 books, ate like a pig and tried out a couple of bookmarked recipes (to facilitate the aforementioned eating). 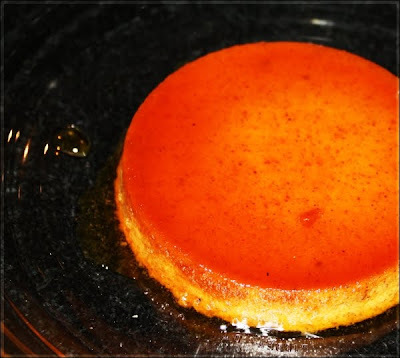 And for all you people who are sick of pumpkin pies and over-eating during the holidays I give you the perfect holiday dessert - pumpkin flan each serving of which is only a 100 calories. If I have a dessert weakness it's custard in any form, flans, caramel custard, creme brulee, so of course I had to try this out! And it was superb, all the wholesome deliciousness of pumpkins co-mingling with the richness of custard, caramel and a gentle hint of spice. A perfect recipe to flummox your guests with, who'd have thought of pumpkin + flan together huh?! The pumpkin puree I used wasnt finely pureed so I got a chewier texture than flan generally has, if you dont like that I'd suggest giving the puree a little whirl in the food processor. And since the recipe was such a big hit the first time, I just had to make it again - the second time around I added about 1 tbsp. of orange rind and served with vanilla ice cream. The plates were licked clean, and my guests were truly thankful! What did you guys do/ eat for Thanksgiving? For the international visitors, how was your weekend? And did anyone score any great Black Friday deals? I'm the worst bargain shopper, I get easily overwhelmed and end up browsing without buying anything. This time, keeping with the tradition, I bought a winter coat at one of those few, few, very few stores without a Black Friday sale. Le sigh. On biting off more than one can chew! Work has been aggravating lately. It's just been little annoyances piling on top of each other until I feel I'm going to tear a piece off the next unfortunate who is going to add to my work load. To add to my frustrations, I decided to sign up for the NaNoWriMo this month i.e. committing myself to writing a 50,000 word novel in November. The first 2 days went by in a welter of typing. It's the 11th day and according to the schedule I should have written approx 19000 words by the end of today. Instead I have 4700. Four. Fricking. Thousand. And all of them nauseating. It seems every time my characters open their mouths the sound that comes out is mwaaah-wah-wah, I'm boring myself with the story so far. Even the characters names bore me. 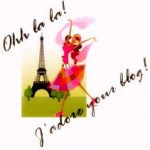 I proudly put the badge up on my blog the first couple of days but have since taken it down in shame. As an aside- it doesnt help that I also managed to read two mind-blowingly amazing books by the talented Laura Kinsale. Just comparing her prose next to my driveling garbage makes me want to take a cleaver to my computer- or atleast my story. Bah! I generally tend not to review the books which greatly move me (I only managed the time traveller's wife and I only got it right the second time). Kinsale's books are in that category, so will try to review but cannot promise it, I never manage to get the emotional content right. Because of all the unneeded frustrations I needed something simple and satisfying to eat today. 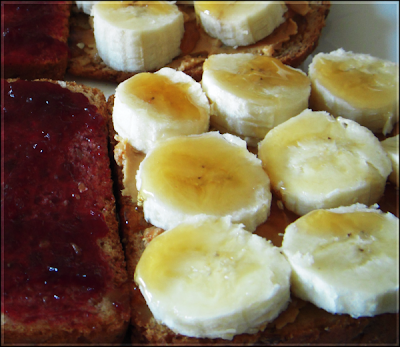 So, I settled on a grilled crunchy peanut butter, jam and banana sandwich. With a puddle of golden honey drizzled on the bananas (because I use sugar-free jam and I needed to amp up the sweetness). I have not calmed down yet. But, lunch sure was comforting. 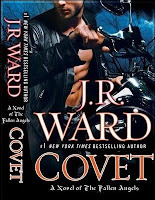 Covet is the first book in the new Fallen Angels series by JR Ward. Jim Heron is a loner and drifter. After being discharged from the military he has been wandering around picking up odd jobs to make a living. One of these has landed him in Caldwell, NY, as part of the construction crew on Vincent diPietro's house. Hanging out with his construction buddies in the Iron Mask, Caldwell's new night club, Jim has an odd encounter with the vulnerable Devina. The oddness is ratcheted up to shock the next day, when she gets out of Vin's car at the construction site- apparently he hooked up with his boss's girlfriend. Startled, Jim loses balance, electrocuting himself and ends up with a new job description. Because, the Earth is a game board, with the angels and demons playing for people's souls. But, the Creator is now tired of the constant fighting between good and evil and has issued an ultimatum, the final deciding factor will be 7 souls. And the player who will manipulate them is Jim, who is the perfect balance between good and evil and thus acceptable to both teams. In the afterlife 4 angels approach Jim and charge him with the task of saving 7 souls- if he succeeds evil will be vanquished from the world forever and if he does not, the world ceases to exist passing under the dominion of the demons. On this gameboard, the angels and demons play to win, and are not above putting little bit players to help or hinder Jim as the case maybe. And as it turns out the first soul he has to save is Vin's, embedded in avarice. Vin comes from a poor background and has a relentless drive towards earning money and surrounding himself with the material trappings of success- cars, furniture, art, complete with the stunningly beautiful model girlfriend, Devina. He doesnt believe in donating his money, wanting some service or return with every dollar he spends. He believes he is happy, but is shocked out of his inertia when he cannot bring himself to propose to Devina. The revelation comes about when he meets Marie-Terese, a prostitute (with the proverbial heart of gold) at the Iron Mask. Marie-Terese is a single mother who is running from a criminal husband who tried to kidnap her son, is living under an assumed name and doing the only job she thinks she can to pay off the debts she has accumulated. With the demons trying to take over Vin's soul, Vin must look to Marie-Terese, the woman who quietens the greedy beast within him, and Jim for salvation against the evil that threatens to consume him. Let's get this out of the way- Covet is marketed as a new series and it isnt part of Ward's other series, the Black Dagger Brotherhood. However, to muddy things up a bit, it takes place in the same location as the latter and Trez, Officer de la Cruz and Phury from the BDB have cameos here. Additionally, the style is similar to the BDB, even though the mythology is completely different. I'm not sure how new readers will relate to this book since there are a few bits that might come across unexplained (the cops carrying out only a rudimentary investigation, for instance) but for me, I was happy enough to return to a much-loved world. And I quite liked the story and the whole angel-demon mythology setup. As with the other books, there are multiple story-lines. We have Vin and Marie-Terese, the primary romance. A stalker-type fixated on MT (unfortunately this is the track which doesnt work, I had no clue behind his motivation). Four British, croquet loving angels and dog, in an over-the-top, silly track . Jim, and his fallen angel helpers, riding Harleys and wearing leathers :) and Dog (the dogs really, really confuse me). And the demon who has its hooks into Vin. Interestingly we never see a portion of the climax between the fallen angels and the demons, maybe it's left for the sequel. Only Jim's character really worked for me though, when he's first introduced he's a blank slate, and we pick up bits and pieces of his background as we go along. All the rest are stock Ward characters. I know it sounds like a lukewarm review, but I did enjoy the book while reading it. I know I'll keep reading since this series has a promising arc and I am still hoping for a read as compelling as the BDB (ummm, ok, gun to my head, like the first 3 books). I do think some of the stories are going to have the demons winning so those should make for some interesting reads. If you are looking for a fun paranormal read, pick this one up . But, if you want to start reading JR Ward, you cannot go wrong with the Black Dagger Brotherhood series. I received my copy thanks to a giveaway at Reading, Writing and Ranting.